What is this Heavyweight Contender kit, you ask? 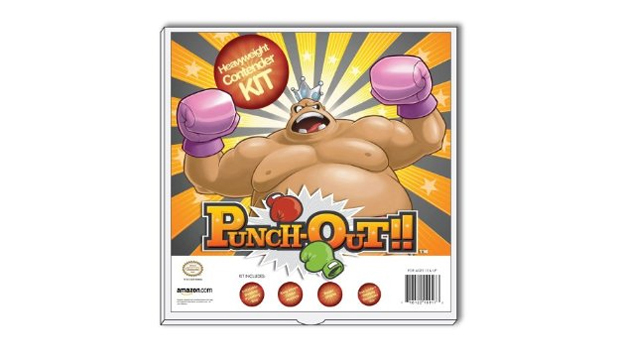 Why, it's a marketing tie-in for the upcoming Wii version of Punch-Out!!. Exclusive to Amazon.com, the kit contains a replica of King Hippo's crown, the King Hippo desktop punching bag, official King Hippo boxer shorts and Doc Lewis' remedy chocolate bar (I hear it heals wounds). Yes, this is a bit silly, and it doesn't come with an actual copy of the game. Still, I have to admit I laughed when I saw it. It's priced at $34.99 and available here, should you be so inclined. You know, I know it's a shot in the dark, but I think an action figure of King Hippo would go over a bit better than this kit would. Also, if a Soda Popinski figure follows it, I can finally get my revenge by stomping on it and tossing it out the highest window I can find in the city of Miami.